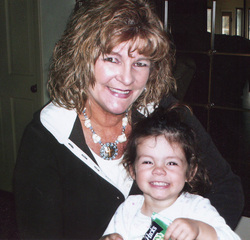 Me with my granddaughter Heely. I started making almond roca around the holidays about 20 years ago. It was always such a big favorite to everyone, they said I should start selling it! I started adding and changing ingredients to my recipe until I came up with the perfect almond roca. I think you will agree! I always had little bits and pieces of my almond roca left over that I couldn't just throw away. That's when I came up with the idea of using it in my espresso fudge. I think it is a very tasty combination you will enjoy!